We all do a lot of notetaking – in meetings, at lectures, out on visits, when we’re travelling, at work, at home….there’s a lot of it going on. The apps mentioned are free – some may have an option to pay for more features/premium versions. To help you get started with the app you might find Introduction to Microsoft Onenote for iPad useful. Or a longer tutorial to give you more info on the main features. 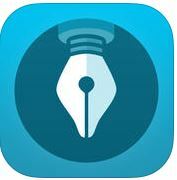 Take notes by hand or with soft-pen, closest you can get to feel of a notepad and pen on iPad. Notebooks can be synched to Evernote account. For more ideas and inspiration find out how students at Manchester Medical School use thier iPads for notetaking.